HYTRONIC technology, an Emery Winslow exclusive, combines state-of-the-art electronic instrumentation with virtually indestructible hydrostatic load cell weight sensing for a system with no electronics in the area of greatest potential abuse - the scale platform. HYTRONIC design allows the sealed hydrostatic weight signals to be transmitted to a clean, controlled area where the signals are totalized and converted into a single electronic signal, which in turn drives the scale's digital weight indicator. In an electronic weigh system, the electronic load cells, cabling and summing boards ARE environmentally sensitive. 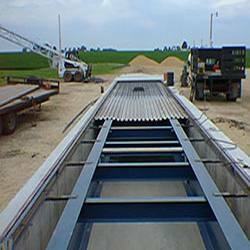 In a HYTRONIC weigh system, the load cells and tubing ARE NOT environmentally sensitive. The first environmentally sensitive component in the HYTRONIC weigh system is the electronic transducer, a Summing Totalizer component. By placing the Summing Totalizer away from the scale load receiving element and remote from hostile environment, it is secure against damage and defective performance. Food and Chemical Industries are common users of HYTRONIC weigh systems. Transportation, Agriculture, Fertilizer, Steel and Metals, Highway Vehicle Control, Airplane Industry and many more use HYTRONIC technology. These industries typically have environmental factors that "strain" electronic load cell technology, frequently exceeding their limit of endurance. The result is a costly replacement or retrofit. With HYTRONIC technology the toughest environmental factors are neutralized. Because hydrostatic load cells have all but eliminated wear points, life expectancy is very high. A ten (10) year warranty on the Emery Winslow truck scale hydrostatic load cell against wear and tear damage speaks to the reliability in high usage installations. Hopefully, we have increased your curiosity about Emery Winslow HYTRONIC WEIGHING TECHNOLOGY. Although we wish HYTRONICS were the solution to all weighing problems, we fully understand its limitations. Perhaps its severest limitation is the cost of HYTRONIC versus electronic equivalents. It is a more costly technology and thus cannot effectively compete on a cost of purchase basis. However, when the cost of a HYTRONIC product is compared to an electronic equivalent on the "cost of ownership" basis, it clearly becomes a best buy, the least costly and high cost consideration is no longer a limiting factor. 2 year warranty on all other components against defects in materials and workmanship.